We didn't just get into this business. In fact, we've been breeding and raising cattle on our farm for decades. Part of that process has involved selectively breeding Wagyu to encourage the best traits in our cattle. This includes a friendly disposition and most importantly superb marbling and flavor. Wagyu, which are four breeds of Japanese cattle world renowned for their quality, have slowly made their way to the US over the last decade. They are notorious for their incredibly dense marbling and exceptional flavor. We've gradually built a herd of American Wagyu cattle that have bloodlines descending directly from Japanese breed stock. It is also important to us that our cattle are raised in a low-stress environment. This means a friendly, hands-on approach with familiar faces they see on a daily basis, minimal transport, and a comfortable home. Here's the truth... the thing about American Wagyu is that it's kind of like the wild west right now. There are an increasingly number of folks claiming that they are producing American Wagyu, but this term is not formally defined. While there are several governing bodies, none have created a system of qualification and standardization that is widely accepted. 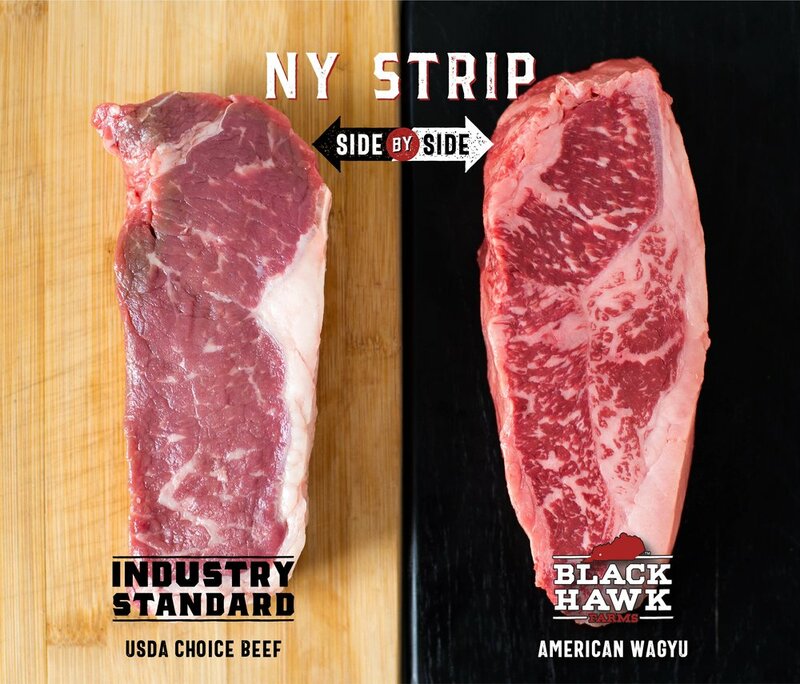 We define American Wagyu by several factors, first and most importantly: the breed of cattle. While there are four breeds that are used in Japan, we use the Tajma breed specifically. Originating from the Hyogo prefecture, they are generally smaller framed with slower growth rates, but produce excellent meat quality with large eye muscle and superior marbling. We go through painstaking measures to ensure the quality of our bloodline. We then take these pure-bred animals and cross breed them with Black Angus animals. This 50/50 crossbreed has all of the awesome qualities we love in Japanese Wagyu with the sturdiness of Black Angus. Beyond breed, we also look at the general quality of life. You can import and breed the best Wagyu in the world, but it wouldn't mean a thing unless you raise it in an environment conducive to bringing out its highest qualities. This can mean a number of things such as: living conditions, animals per acre, and feed. Unlike many other producers, we carefully monitor our feed mix to ensure that our calves are producing an incredibly high level of fat marbling. Through our extended 500 day feed time and our feed mix, we are able to produce a Wagyu calf that has fat marbling unlike many others found in the United States. Our cattle are grass fed for the first eight to nine months before moving to our finishing barn, where they are fed a mixture of non-GMO white corn and hay from our wheat fields. Unlike many other operations, our cattle are free from added hormones and antibiotics. While this means it can take 25% longer to bring them to market, the result is a richer, fuller flavor with superior marbling. Instead of the industry average of 180 days for the finishing process, we finish our cattle for 500 days. It's a difference you can taste. Marbling is one of the critical things we look for in our meat, and it is generally a sign of high-quality in terms of beef production. But what is it, and why does it matter so much? Marbling occurs for a number of reasons. The first being breed. While all breeds will produce some marbling, some are specifically bred to increase the density of the marbling. One of the biggest incentives to using Wagyu breeds is their notoriously instense fat marbling. The other factor is the food. When a calf is fed a diet that is high in grain over a slow period of time, it allows fat to slowly and evenly disperse through the muscle tissue of the meat. On conventionally fed lots, calves are often fed grain for less than six months, which isn't enough time to achieve significant marbling. This extra fat provides an amazing amount of flavor and texture. Black Hawk Farms Angus Beef is available to chefs and restaurateurs looking to provide the best local products to their guests. Prime and Premium Cuts Available with Special Arrangement.